Investing in solar stocks can be a complicated process for investors. Here's a guide to get you started. Rooftop solar gets a lot of attention in the U.S., but the utility scale solar business is far bigger, both domestically and around the world. Image: SunPower. The solar industry is a $120 billion global industry that's beginning to upset the entrenched energy sector. From the U.S. to China, from small homes to massive deserts, there's almost nowhere that solar energy can't touch. There's enough solar energy hitting the earth every hour to replace all other energy sources, including oil & gas, opening up a multi-trillion dollar market. But for investors, solar stocks have been fraught with risk over the years. Needless to say, a number of high profile bankruptcies and poor performing stocks have scared away a lot of investors. But that doesn't negate the industry's potential. Here are a few things to know about solar stocks before jumping in. There are four main components in solar energy, at least as far as investing goes. There's the solar panel turning the sun's energy into electricity, the inverter turning the solar panel's DC output into usable AC current, the system developer lining up projects and installing necessary components, and the financier of a solar project. Some or all of these pieces may come from the same company, but a solar company will often specialize in just one or two. For example, SolarCity (NASDAQ:SCTY.DL) is a system developer and financier of solar projects, but doesn't manufacture inverters or solar panels (not yet, anyway). Even with this basic understanding, not all solar companies within each space are created equal. Companies that can pack the most power generation on a roof will be the winners long-term. Image: SunPower. What investors need to understand first is that many solar companies are essentially making or selling essentially the same product. SolarCity's solar system isn't really any different than Vivnt Solar's -- soon to be acquired by SunEdison (NASDAQOTH:SUNEQ) -- and Yingli Green Energy's solar panel is essentially the same as Canadian Solar's. The same goes for many inverter manufacturers, financiers, and systems developers. Two companies that make noticeably different products are SunPower (NASDAQ:SPWR) and First Solar (NASDAQ:FSLR). SunPower makes the most efficient solar panels in the industry, currently 21.5% at the high end compared to 14%-16% for a commodity panel, and First Solar makes a thin-film panel that it says will soon be nearly 20% efficient. Both companies are also vertically integrated, nearly entirely up and down the supply chain. This differentiated technology and flexible business model puts them a step ahead of companies that use the same products as everyone else. This differentiation hasn't gone unnoticed, though. SolarCity bought Silevo in order to improve its panel efficiency and pack more power generation on each roof, and SunEdison has worked on researching higher efficiency as well. But right now First Solar and SunPower are the only two to really differentiate themselves in this way. What investors need to start watching in solar stocks is the next phase of technology development: a full energy solution, including energy management and energy storage. This is where SolarCity and SunEdison have taken leading roles as major systems developers. SunEdison recently bought Solar Grid Storage to develop large scale energy storage projects, which could be included in solar system bids in the future. SolarCity's natural partnership with Tesla Motors (NASDAQ:TSLA) should allow it to be a leader in the residential energy storage business, although a business model for that has yet to emerge. Inverter manufacturers like Enphase Energy are also testing energy storage as a way to differentiate themselves, so nearly everyone is getting into the game. SunPower also has its own energy management and storage partnerships, intended for residential and commercial solar systems. The companies that lead the solar industry into the next phase of development through managing energy and deploying it when it's most economical will be the real leaders over the next decade. One investment strategy I see many analysts pushing for retail investors is solar ETFs, like Guggenheim Solar ETF (NYSEMKT:TAN). A solar ETF will ensure that you get some exposure to leading companies, but the downside is that you'll also have exposure to all of the great collapses in the industry (like Suntech Power, Q-Cells, and Yingli Green Energy). 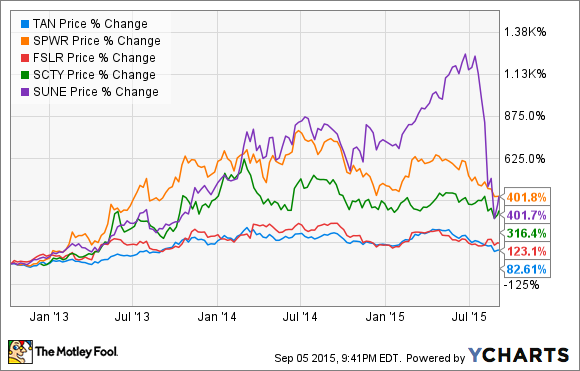 See below how the ETF underperformed every leading solar company over the past three years. The better way to invest in solar stocks would be to buy a basket of high quality companies, like I've mentioned above, and avoid non-differentiated competitors. Solar stocks can be an up and down slog for investors, but long-term it's an industry that could change the world -- and that opportunity doesn't come along everyday. Investors who buy into technologically superior solar companies with the scale and know-how to navigate the industry as it develops will have huge winners on their hands. But it's a long-term game, and success is measured in years and decades, not days and weeks, something all investors in this space need to keep in mind.